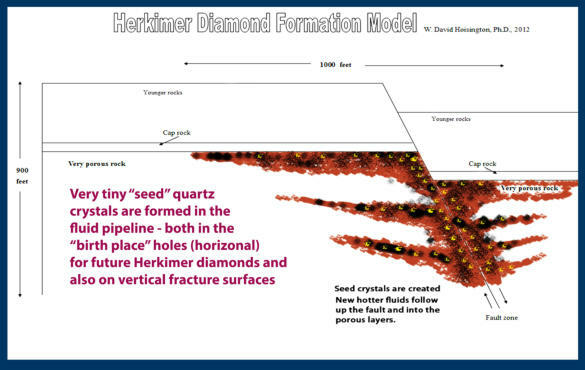 Seed Crystal Event: Very tiny quartz crystals, by the millions, are formed throughout the Herkimer Diamond District.. The group of crystals below would easily fit into the palm of your hand. 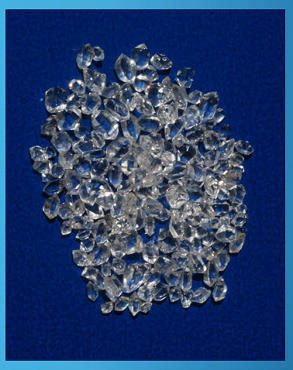 Second in importance to the formation of Herkimer diamonds (after the presence of hydrocarbons) is the presence of very small Herkimer diamonds - smaller than those shown in the photo above. The field evidence suggests that these very tiny (less than 1/10 of a mm) quartz crystals were in abundance prior to the formation of the larger Herkimer diamonds. There is also strong evidence that a “crystal frost” event happened near the same time as the when the seed crystals were formed. It appears that this Frost-Seed Crystal event is one that is found in many Herkimer diamond like locations around the world. Is there a process happening in the Herkimer Mining District that can be described and then applied globally? Every mine, deposit, in the Herkimer District shows evidence of both the oil event and the seed crystal event - thus the name of the new theory “The Oil and Seed Crystal Theory”. But this does not mean that every rock you break open will contain evidence of these two events. There are four important factors that govern what you will find when you crack open a rock looking for Herkimer diamonds: 1) how open were the holes, 2) how much access did the fluids (initially seed event and then the Herkimer event) have to those holes, and 3) did weathering change what was there? Every mine in the district looks a little different and it is basically because of variations in these three conditions as well as a fourth - the influence of vertical flow versus horizontal flow and proximity to the major “pipe” structure (click button - vertical flow to see more evidence and discussion).